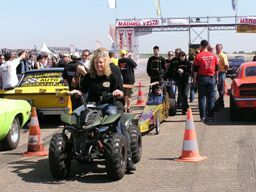 It was lovely racing weather in Chambley, and we shared the pit area with Lisa Selles and her junior dragster. The junior dragster has a really impressive team this week-end! We have to perform 1 show run each day, so we have spare time to go and see the action from the stands at the strip. At the night shows we performed a few burnouts which were clearly appreciated by the cheering crowd! It was a lovely week-end with lots of sunshine, fantastic crowd and nice pit-area company!